However the limiter works as it has for me before when I set the limit to ACES AP1. The over saturation is gone and the light has the correct luminance. I guess I’m not as clear on the difference between ACES and ACES AP1 and would just like some feedback about whether I am going about this the right way. Hey all, still wondering if anyone has any advice for this situation. I might not have an advice on the saturation issue but I just might write a post anyway. We shoot a lot with the URSA Mini Pro 4,6K at our studio and we recently started to use BRAW. In Resolve when using BRAW the IDT comes from the RAW developer so it is not necessary to set IDT:s for all of the files. It will make no difference. In the RAW developer there are some settings that we have stumbled on recently, we are not experts yet… If you use the Resolve default settings the image will look super bright and really bad but the highlight is recoverable. When using the metadata from the camera, the image will look good although with high contrast. For now there seems not to be any possibilities of fine tuning the de mosaic process as the controls are greyed out, and I will ask Blackmagic about this. Here there should be possibilities to work with the saturation I would hope. 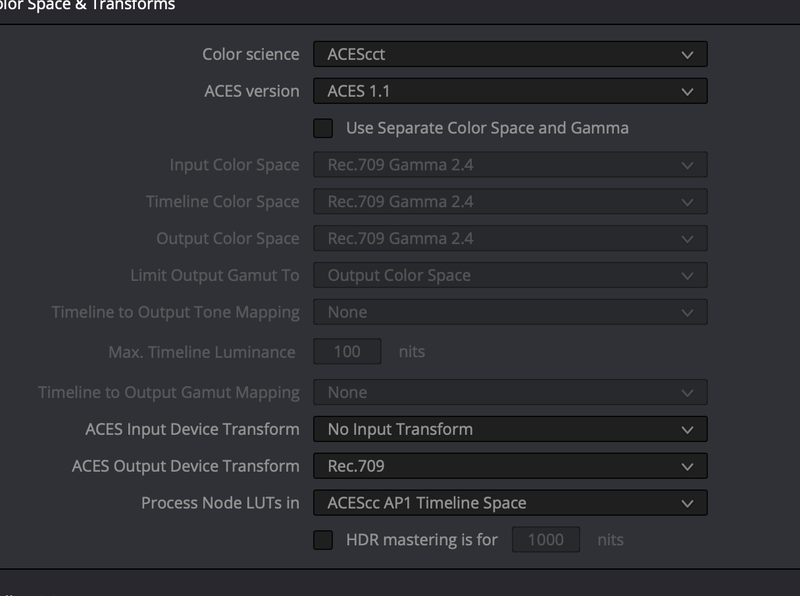 Concerning AP1, this is not the full ACES gamut but more or less rec2020, the way I get it. The grading will be done on AP1 in ACEScc/cct, which is a log version more suitable for this. The math, however should be done using the AP0 gamut. From my perspective I would say that ACES grading is less forgiving than Log grading since the tone mapping has to be done manually. I would say that you have to work harder to get the desired results. I really prefer working in ACES though as this is a scene referred color space which brings more opportunities. At our studio we have developed a pipeline purely on ACES. All the best and get back to me for a discussion. I think ACES needs to be discussed back and forth. It´s a simple theory but when it comes to implementation it becomes more tricky and it´s easy to do things wrong. I don´t know how the gamut limiter works but since you are grading in AP1 already I would suggest another way to grade. Try to figure out a way to do the tone mapping manually. It’s possible this is similar to an issue frequently seen with bright, saturated colors (usually self-luminous colored LEDs) There is a lengthy chain about this issue here: Colour artefacts or breakup using ACES, and it affects many different cameras. The reasoning is a bit too complex to go into here - but it’s a well-known issue. As a temporary fix you could try applying the CLF>LMT Neon Suppression to the problematic clips. I don’t know if the correction matrix contained in there will work for URSA cameras, but it seems to work for many other cameras. 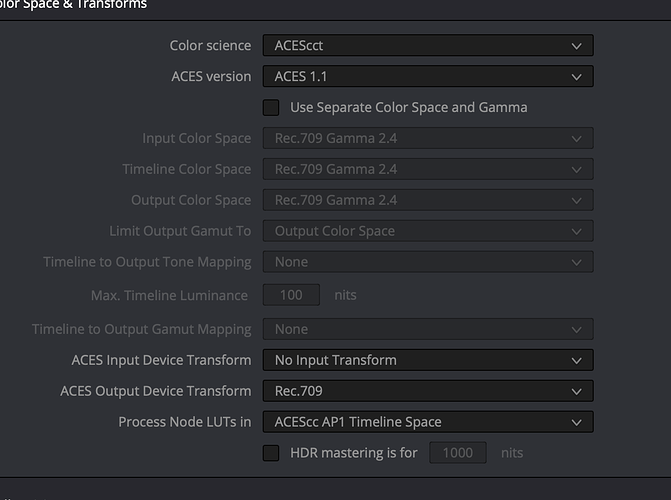 Without having had any test frames or information about the URSA Mini 4k’s spectral sensitivities when deriving the correction, I can’t 100% confirm that the two are related or if the Neon Suppression LUT will help, but it’s a quick fix you could try and see if it helps. Thanks for the responses everyone, I will try some different tone mapping methods as well applying the CLF>LMT Neon Suppression, and post the results I get here for comparison, I really appreciate the advice!